I've waited to post about this topic on the blog because I wasn't sure initially that I would stick with it. But since it's been about a month it's time to share: I have fallen in love with a new hobby, decorative planning. I first heard about it on youtube--sadly I've forgotten exactly who it was, but I stumbled on a video of someone showing their Happy Planner setup for their craft projects and I was intrigued. Backing up a bit I would say that generally I'm a fairly disorganized person. I've tried many different systems through the years including using various apps on my computer and phone but I've just never been able to stick to anything. And as I've aged I'm finding it more difficult to remember all of the things I need to keep in my brain, not because I think I'm losing it or anything but simply because there are more things than ever to try to keep track of. And specifically I really wanted a way to be able to take notes on my projects so that I could remember the details later. I can't say how many times I've given up on trying to blog a project because I finished it a few weeks ago and now can't remember most of the specifics. Again, I tried using google docs and other things but sometimes it's just easier to write it down on paper, ya know? I remember right after I graduated from college and got a job I bought a Hello Kitty planner. I used it for a few months because I thought it was cute, but it wasn't really set up the way I would have wanted to use it, so I gave up after awhile. I haven't used any kind of paper planning system since. And honestly decorative planning did sound kind of lame to me at first. Like Type-A adults playing with stickers like they are little kids. Or that scary single woman who has a giant wedding scrapbook that she started as a teenager. But I was very wrong. I realized that taking a mostly blank layout and finding ways to make it aesthetically pleasing while still being useful is pretty much what I do in my day job (I'm a webmaster). Making my planner spreads pretty and fun is a way to keep me engaged and actually using the planner. And as I've gone along I've found all sorts of useful things to keep track of, like marking down the last time we gave our dogs a bath, or when I last oiled my sewing machines/spinning wheels. Or tracking my discretionary spending habits so that I can see it laid out in front of me that I tend to buy things on days when I'm bored. I'm even making a concerted effort to work on my atrocious handwriting. I went to Joanns and bought a classic happy planner and a few sticker books. There are things I don't love about it. Mostly I'm not a fan of the canned sentiments sprinkled throughout the planner itself and all the sticker books. I find quotes a lazy substitute for actual thought and upbeat faux-inspirational quips are pretty irritating to me. But the good thing about the system is that it's completely customizable. So I've been either ignoring the quote stickers or cutting/covering them up if the stickers are pretty but the words are annoying. I'm also pretty sure you can cover your dashboards with stickers or other paper though I haven't gotten around to it yet. I ended up buying a second planner and doing a semi-transformer planner. 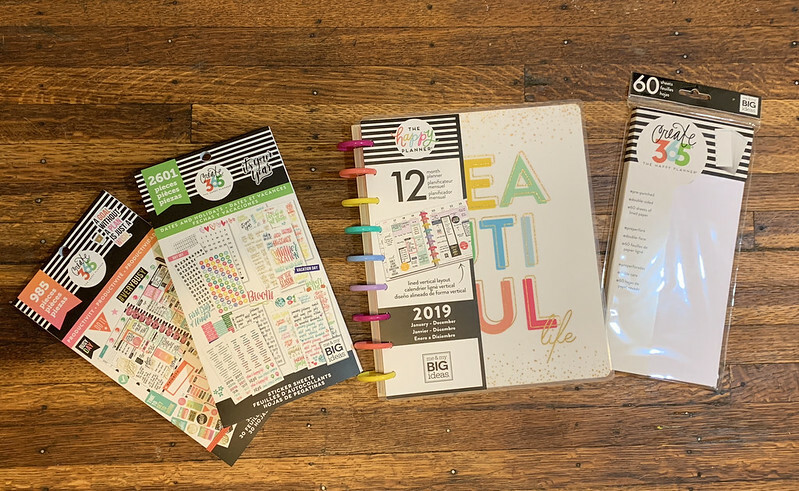 I found that I had too much stuff to write in just one, so I have one designated planner for tracking my craft projects and another for everyday life. I keep the full year of the main planner with me at all times with just 3 months of the craft planner in the back since I'm not generally planning that far ahead with my projects, and it seems to be working for me so far. The main thing is that I have found cute indie planning stickers. How on earth did I live before I knew these existed? I won't lie--I went a little crazy in January soaking up all the cute things. But seriously, Harry Potter washi exists--like a lot of it from many different companies. I've put the restraints on and am doing a spending freeze for February, but after this month I think I will put in the practice of ordering from one new-to-me shop a month. I also subscribed to 2 different monthly kits, Simply Gilded and Happie Scrappie. I've only received SG so far. As a newbie I don't quite know what to do with everything yet but I am having fun figuring it out. This is not sponsored content, btw--I just started planning so I am nobody special. In fact, I'm still in the process of figuring out my decorating style and how exactly I want to use the various spreads. I'm not going to be all planning content all the time or anything but I will probably share a few things here and there whenever I think they are particularly noteworthy. I think my previous prejudice was due to believing that I only engage in "useful" hobbies--the kind where you end up with something you can use in the end, like clothes, or blankets, or bags, or yarn. But decorative planning has been very useful to me so far in helping me to stay organized and it's also therapeutic. So yay for decorative planning! I have never heard of this before. I am way too lazy to do ths, but I can see how it would be helpful.